Georgia’s season has been a bit on the forgettable side, but the Bulldogs can claim the season series with Georgia Tech for the second year in a row. 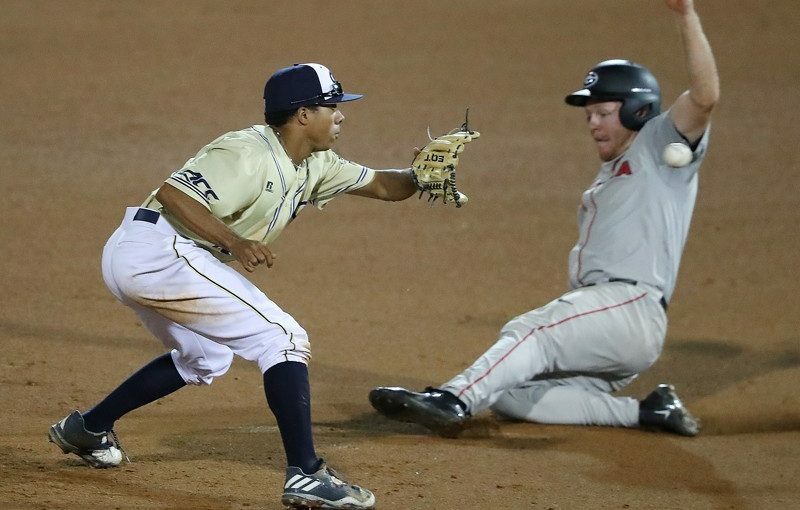 Georgia exploited two fruitful innings and an effective start from Kevin Smith to beat the Yellow Jackets 7-5 at Tech’s Russ Chandler Stadium Tuesday night. The Bulldogs, last in the SEC in ERA (5.11 coming into Tuesday’s game), have now held Tech to six runs in their two wins. Georgia beat 5-1 April 11 in Athens. Georgia will go for the sweep in the series finale at SunTrust Park May 9. The Bulldogs have not swept Tech in a season series of three or more games since 1984. “This is a huge game for Georgia Tech fans and for us, so to lose it, just disappointing,” Tech coach Danny Hall said. Smith went four innings, giving up five hits and walking one while giving up one run, to earn the win. Schniederjans took the loss. Georgia (17-25) had lost six of seven after beating Tech (20-20) in Athens.